International trade in food relies on a small number of key ports, straits and roads, which face increasing risks of disruption due to climate change, a report said. Disruptions caused by weather, conflict or politics at one of those so-called “chokepoints” could limit food supplies and push up prices, the study by British think-tank Chatham House warned. 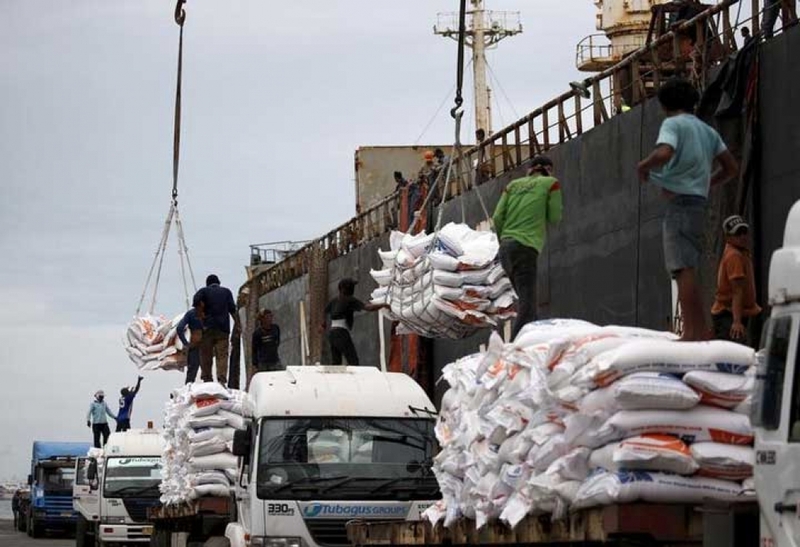 Workers unload imported rice from Vietnam from a ship at Tanjung Priork port in Jorth Jakarta, Indonesia, December 15, 2015. “The risks are growing as we all trade more with each other and as climate change takes hold,” Laura Wellesley, one of the study's authors, said in a statement. Almost 25 percent of all food eaten around the world is traded on international markets, the report said. The amount of maize, wheat, rice and soybean moved across the world each year is enough to feed some 2.8 million people and more than half of it passes through at least one of 14 inland routes, ports, and straits, like the Panama and Suez canals. About 20 percent of global wheat exports, for example, transit via the Turkish Straits, while more than 25 percent of soybean exports is shipped across the Straits of Malacca. But infrastructure at these junctures is often old and ill-suited to cope with natural disasters, which are expected to increase in frequency as the planet warms, said Wellesley. Roads in Brazil, the world's largest exporter of soy bean, for instance, were exposed to the risk of flooding and landslides caused by heavy rains, while U.S. Gulf Coast ports could suffer more storm surges boosted by rising seas, she said. That posed risks for the food security of importing countries and the economies of those exporting food, she added. The report called on governments to invest in “climate-resilient” infrastructure as well as taking other precautionary measures such as diversifying food production and stocks.